Randall Wolfgang is an internationally renowned oboist. He has held the position of principal oboist of the New York City Ballet Orchestra for 37 years. He was also a member of the Orpheus Chamber Orchestra during its formative years, when it went from an unknown, conductorless New York chamber orchestra to a famous orchestra touring the world and recording for the Deutsche Grammophon label. His playing is featured on more than 30 recordings, including Mozart’s Oboe Concerto. Mr. Wolfgang has been the principal oboist of the New York City Opera Orchestra since 1992. 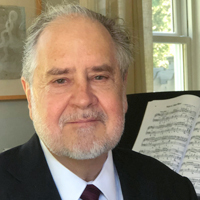 His past accomplishments include earning a Grammy Award and serving for many years as the principal oboist and as a faculty member at the Aspen Music Festival and School as well as a guest artist and faculty member at the Aspen Music Festival in Nagano, Japan. Mr. Wolfgang has also appeared at the Marlboro and Monadnock music festivals and at the Great Mountains Music Festival and School in Korea. He has served on the faculties of Queens College and the Manhattan School of Music.